AMy exploration of the life of former University of Kentucky basketball player Derrill Wason Hart and his Civil War ties now focuses on the career of one of his family members. According to this link, Derrill's father Robert was one of six brothers to fight for the Confederacy. Among the other five was Derrill's uncle Colonel Benjamin R. Hart. I found Benjamin's name and rank on the site I linked above and used it as a starting point for my research. I first looked through the National Park Service's Soldiers and Sailors database and found conflicting information. It lists a Benjamin R. Hart in Company K of the 22nd Alabama, showing him entering the service as a captain and leaving as a major, not a colonel. Its database's unit page, does, however, list B.R. Hart as a colonel. I cannot explain the reason for this confusion, but have found other sources that confitm that Benjamin was indeed a colonel and that he died in action at the Battle of Ezra Church. Benjamin's records at ancestry.com and fold3.com are very helpful. They show he was 6 feet tall with blue eyes, brown hair and fair complexion. He was a farmer who had enlisted on October 6, 1861 at Notasulga, Alabama. He apparently enlisted as a captain and gained promotion to major on December 13, 1862 and then to Lieutenant-Colonel on September 23, 1863. He was further promoted to Colonel on February 11, 1864, with the same confirmation date. It took effect December 15, 1863 and was accepted March 7, 1864. The same document includes the notation "killed near Atlanta, Ga., July 28, 1864." It lists the name J.A. Seddon, the Confederate Secretary of War, on the front page, under "subsequent disposition." I have attached an image of it and hope it shows up large enough and is legible. Other documents mention his previous promotions and one shows his pay reached $195 per month. One site notes that Benjamin was also wounded at Chickamauga on September 20, 1863, which paperwork on ancestry.com supports, and this link gives his middle name as "Rufus." genealogy website. He was born April 7, 1834 in Ramer, Alabama and was a planter in the pre-war years. He was the second oldest son of Benjamin and Anne Hart, and was likely named for his father. The book mentions his promotions and states he was wounded at both Shiloh and Chickamauga, then, at Ezra Church, was "shot once leading a charge and a second time when being helped off the field. Body fell into Union hands and presumably was buried on the field. 'A pure patriot and a gallant soldier.'" 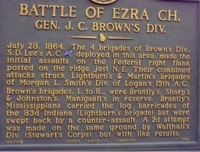 The 22nd Alabama was in General John C. Brown's division during this battle. Benjamin Rufus Hart was only thirty years old when his life ended hundreds of miles from home, leaving his family, like so many others, north and south, grieving over a loved one gone too soon. His probable burial on the battlefield likely meant the family had no final chance to see or say goodbye to his body. Making this time even worse, his brother Robert had gone on furlough due to illness at a surgeon's order only a week before Benjamin's death, creating more sadness and worry for the family. Here is an image of the 22nd Alabama's regimental flag under which brothers Robert and Benjamin Hart fought and under which Benjamin sacrificed his life. Benjamin's rank of colonel was the highest any Hart brother attained during the war, but four other Hart brothers (besides Robert and Benjamin) enlisted to fight in the Civil War and I will post their stories soon. Wounded rather early in the 11:30 a.m. charge across Brotherton's field, Sunday Sept. 20, 1863, at Chickamauga.